It appears that our friends from Apple have leaked some drool-worthy information on the net with their latest concept, the triBook. Are you impressed yet? These side screens are perfectly sandwiched in between the main display and the keyboard. Every time a user wants to use the triBook, you just have to unfold it like opening a cardboard box. 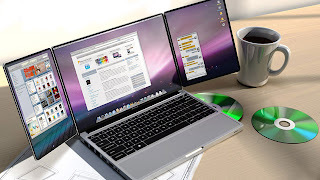 A user also has the option of combining all three screens for a landscape display of about 21 inches. The triBook is just a concept, but who knows what the future will bring.